How long does it take for a newborn to recognize an object? Adults can recognize objects rapidly, but measuring object recognition speed in newborns has not previously been possible. 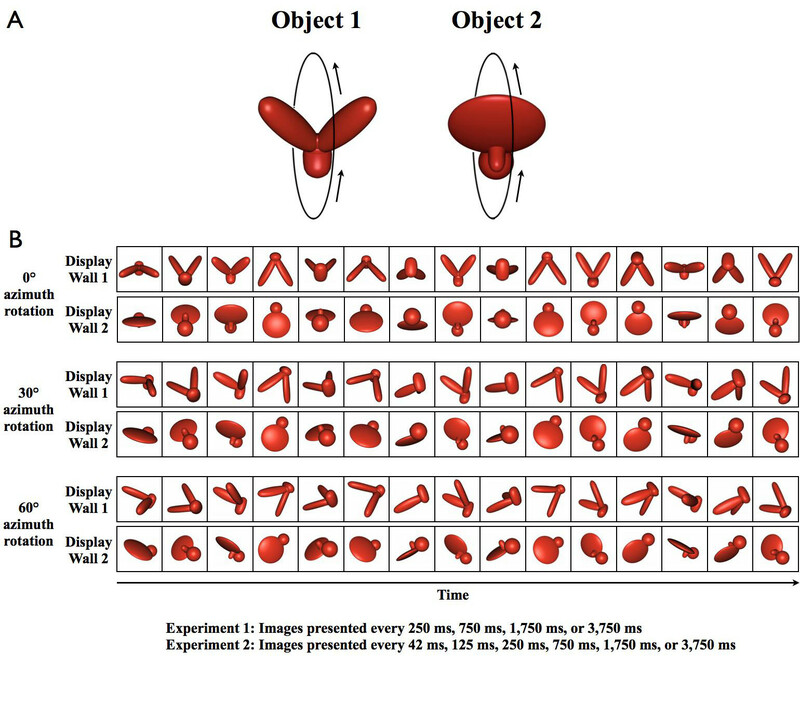 Here we introduce a high-throughput controlled-rearing method for measuring the speed of newborn object recognition in controlled visual worlds. 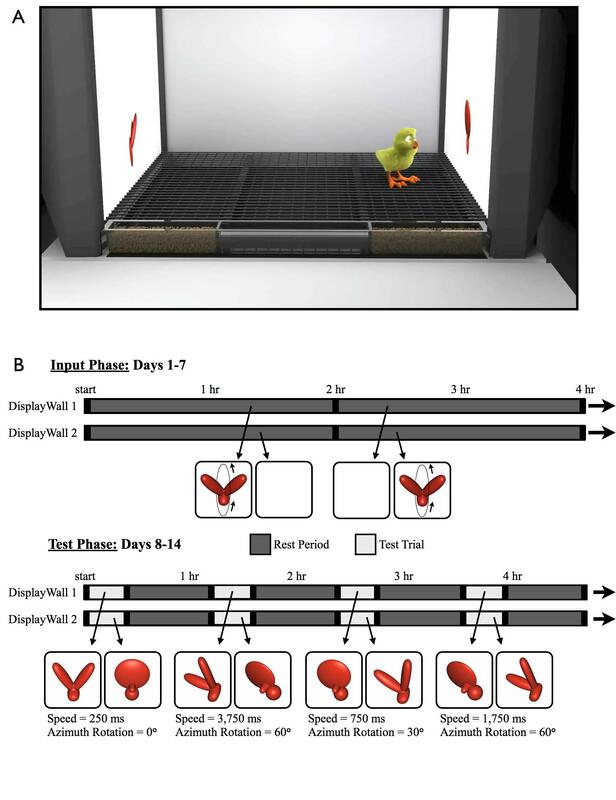 We raised newborn chicks (Gallus gallus) in strictly controlled environments that contained no objects other than a single virtual object, and then measured the speed at which the chicks could recognize that object from familiar and novel viewpoints. The chicks were able to recognize the object rapidly, at presentation rates of 125 ms per image. Further, recognition speed was equally fast whether the object was presented from familiar viewpoints or novel viewpoints (30 and 60 azimuth rotations). Thus, newborn chicks can recognize objects across novel viewpoints within a fraction of a second. These results demonstrate that newborns are capable of both rapid and invariant object recognition at the onset of vision. Stimuli. (A) In the first week of life (input phase), newborn chicks were raised with a single virtual object rotating around a single axis. The chicks were imprinted to either Object 1 or Object 2. (B) In the second week of life (test phase), we used an automated two-alternative testing procedure to examine whether the chicks could recognize the imprinted object from the input phase. During the test trials, we projected successive images of the imprinted object on one display wall and successive images of an unfamiliar object on the other display wall. Across different test trials, the chicks were tested on all combinations of 4 presentation speeds (250 ms, 750 ms, 1,750 ms, 3,750 ms) and 3 azimuth rotation changes (0º, ±30º, ±60º). In Experiment 2, we tested the chicks on two additional presentation speeds (42 ms and 125 ms), and the unfamiliar object was presented from the same azimuth rotation as the imprinted object in the input phase. (A) Illustration of a controlled-rearing chamber. The chambers contained no real-world (rigid, bounded) objects. To present object stimuli to the chicks, we projected virtual objects on two display walls (LCD monitors) situated on opposite sides of the chamber. For photographs of a controlled-rearing chamber, see Figure 1 in Wood (2013). (B) The schematic shows how the virtual objects were presented on the display walls during a period in the input phase and test phase. During the test trials, different views of the objects were presented sequentially at a constant presentation rate. The different sequential views had the same azimuth rotation and different elevation rotations. Results. 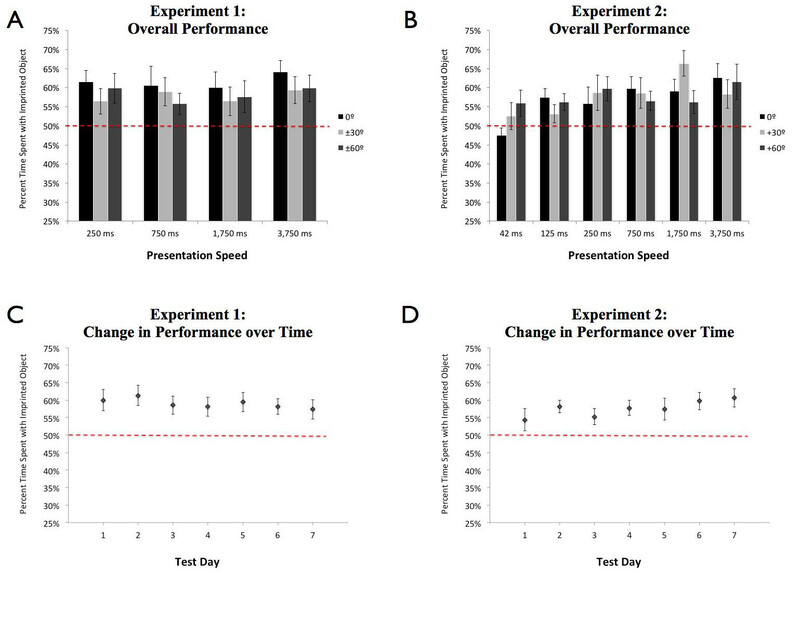 The top graphs show the chicks’ mean object recognition performance across the presentation speeds and viewpoint changes for (A) Experiment 1 and (B) Experiment 2. The bottom graphs show the chicks’ mean object recognition performance across the test phase for (C) Experiment 1 and (D) Experiment 2, computed for the first, second, third, etc., day of testing. Error bars denote ±1 SE. Chance performance (dashed lines) was 50%.